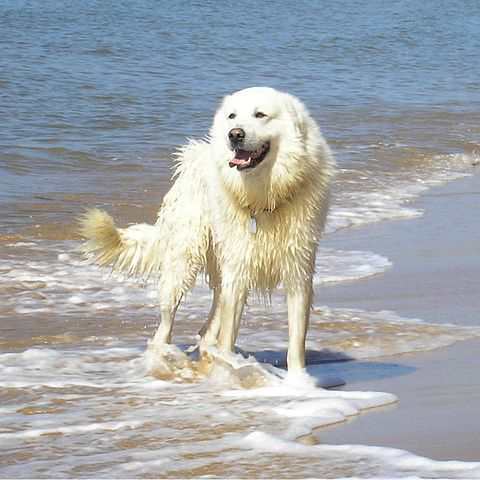 Looking for an excellent LGD, then the Maremma Sheepdog might be just right for you. But if you are not familiar with LGD, then let’s see if this big white dog would work as your new best friend. Just for clarification, we’re not talking about Local Government Districts or Lou Gehrig’s Disease but rather Livestock Guardian Dogs, or those breeds that have been developed for centuries to guard large flocks of sheep and other livestock. Maremma pronounced “Mare” as in the female horse and “Emma” a girl’s name is one such dog that has been guarding sheep on the plains and mountains of Italy for centuries. Just like their LGD cousins, (the Great Pyrenees from France, the Komondor and Kavasz from Hungry and the Anatolian and Akbash from Turkey, and the Tibetan Mastiff from Tibet,) the Maremma Sheepdog works around the clock to assure his flock remains safe from predators, primarily wolves and other local carnivores, but also those two legged burglars. Maremma is an English version of the Italian name, “Maremmano-Abruzzese,” but you are also likely to encounter names such as Cane da Pastore Maremmano-Abruzzese, Pastore Abruzzese, Pastore Maremmano and the Maremma Sheepdog- all names refer to this big friendly dog that takes his job very seriously. The Cane da pastore Maremmano-Abruzzese means the Dog of the shepherds of the Maremmano and Abruzzese. 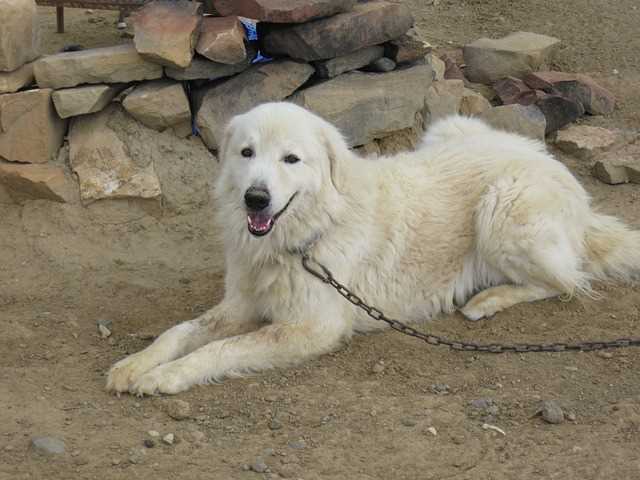 Maremma Sheepdogs are courageous and capable of making instant decisions. Very loyal to their family, they will guard the flock as well as the family preventing any unwanted intruders. Maremma Sheepdogs generally begin their training at a very young age, sometimes as young as 4 weeks old, but by the time they are 8 weeks old, they are living and sleeping with the animals they will eventually guard. They may be fierce guardians against wolves and foxes, but when it comes to family members, they are very affectionate and totally devoted, getting in a hug or two but otherwise wanting to be very close. 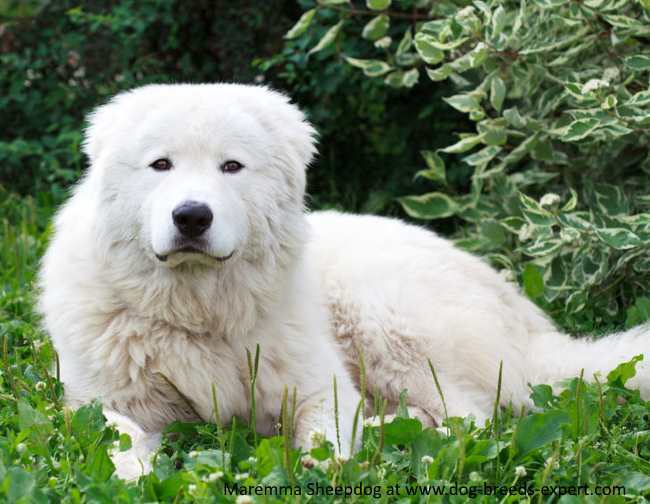 Maremma Sheepdog: The Perfect Family Pet? Does this make them the idea family pet? If you were to ask the Maremma, himself, his answer would be resounding “NO.” With more than 2000 years of breeding and training as a livestock guardian, they are most happy when they have a job to do. They prefer to live and sleep outdoors snuggled with a lamb or two rather than having to temper their rowdy temperament to social niceties expected of companion dogs. That doesn’t mean that all Maremma Sheepdogs spend their lives with a bunch of sheep. Some have been socialized and trained to be good house dogs, but it requires effort and time on the part of the owner to help rewire their brains so that guarding animals will be the last thing on their minds. If you have your heart set on a Maremma as a family pet, you will need to socialize from day one so that they are used to being handled by friendly strangers and introduce the dog to any new visitors that enter your property. 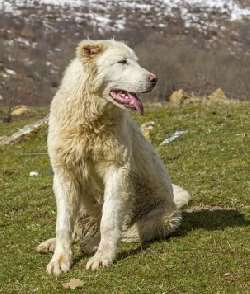 LGDs like the Maremma Sheepdog are not like other Guard dogs that we associate with protecting people such as the Doberman Pinscher, German Shepherd or Rottweiler. These types of guards have innate needs to look for direction from people. They wait for their owners to tell them what they should do. If anything, they will try to guard you, your family members and even your neighbors, if they perceive the neighbor’s property should be within their own jurisdiction. This makes training these dogs a little more challenging. They generally do very well with children, especially those that they consider “their children.” They are tolerant of young toddlers and babies, but may not be so hospitable to children’s friends who play rough. They can construe this behavior as being aggressive and act accordingly to protect THEIR children. They are generally fine with other dogs and even cats, as long as the household pets defer to the Maremma as the boss. Two males of this breed can be aggressive, especially if there is a female in heat nearby. They do not have the prey drive of other breeds meaning that they are not likely to give chase to small animals. They are not a highly energetic breed, at least once they reach adulthood, but since they are a working breed, a fair amount of exercise is needed. Puppies, regardless of breed are a different story. 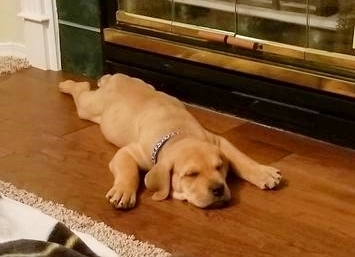 They have energy to spare, so teaching puppies how to channel this excess energy is important. Chewing, Digging, and Barking are all behaviors that can be controlled with training and maturity. Barking, though, is not something you want to train out of an LGD. Barking is the way dogs communicate and typically well behaved dogs who bark are doing so for a reason. Puppies are vocal when they play together, and even playful adults can bark loudly. This is particularly the case with the Maremma Sheepdog. Barking is a way of alerting humans that something or someone is nearby, or something is wrong such as a lamb getting caught in a wire fence. They also use barking as a way to deter predators and to let them know that their territory is off limits. Are sheep the only animals that the Maremma Sheepdog will guard? These dogs are used to guard not only sheep, but goats, and cows, as well as birds such as chickens, geese, and ducks. In some parts of the world, they are used for alpaca and llama guarding. More recently, they have proven very useful guarding Penguins. Yes, Penguins! 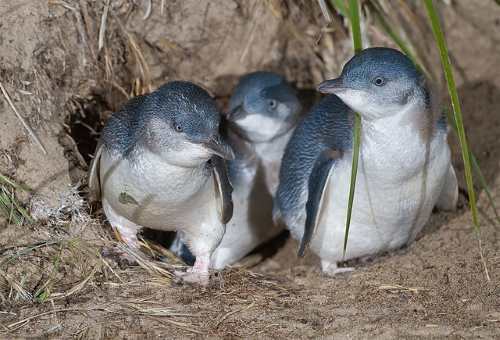 On a small island near Warnambool in Australia, Maremmas are busy protecting Little Pengiuns, the smallest of the penguin species as part of a scientific experiment. Middle Island, where the penguins live, can be accessed at low tide when the channel separating it is only about six inches deep. Enter the European red fox who killed dozens of penguins during their nocturnal sorties. Increased human presence on the island also caused more decline in penguin numbers. The colony was all but decimated when the local city council stepped in and tried various methods to control predation. Thanks to Dave Williams, the city agreed to introduce a Maremma Sheepdog onto the island. After several attempts and different dogs, the population of Penguins has started to come back. This breed along with all the similar breeds (Kuvasz, Akbash, Tatra and Great Pyrenese) can trace its origins back to the Tibetan Mastiff. Each of these breeds was developed separately in their own home countries, but they share a similar role, and that was to protect the flock. Archaeologists have unearthed skeletons of dogs and livestock, side by side in sites dating back at least 6000 years. In the classic Roman text on agriculture dating around 100 BC, Varro, discusses a dog being used as the guardian of goats and sheep to ward off attacks by wolves. Two regions of Italy, the Maremma, and the Abruzzese laid claim to this breed and originally there were two separate breeds. The Abruzzese was considered to be more of a mountain dog but in 1958, it was decided that both breeds should become one. During World War II, the Maremma, like many breeds in Europe was almost eradicated because invading German armies shot them. War tore Europe was not the hospitable place for dog breeding, and many dogs suffered as a result. After the war, Maremma numbers slowing increased. The breed was first introduced to the U.S. in the 1970s as part of a scientific study to evaluate LGD and the guarding ability of several different breeds. The purpose was to find a way to protect livestock without using lethal methods. This study was as a result of the U.S. government’s restrictions on the use of substances to kill predators and the inability of techniques of the time to provide adequate protection to livestock. Today, these dogs are found in many countries including the U.S., Canada, Australia and of course, Italy doing the same job that they have done for 2000 years. A Maremma Sheepdog's coat consists of a dense under coat that sheds twice a year. A coarser outer coat helps repel dirt. They are generally considered to be a clean dog and do not have any doggie odor except them they are wet. Some Maremma dogs that spend their entire life outdoors protecting their flocks and may never get a bath, or groomed. But if you are planning on keeping one of these dogs as a companion a little grooming is necessary. Most Maremma Sheepdogs prefer to sleep outside in a place of their own choosing, and even cold weather does not seem to bother them. They will need shelter from the hot sun, rain, snow, ice and wind. Being outside they will get dirty from time to time. If the dog gets wet or muddy, the dirt will shake off when the dog’s coat dries. If you do bathe the dog, be sure they are thoroughly dry before allowing them to go outdoors, especially in the winter. Their nails will need to be trimmed periodically and their ears checked and cleaned if necessary. Brushing the coat during times of shedding will help protect the coat and remove the excess hair. A well brushed coat will repel dirt and keep the dog more comfortable in hot and cold climates. Independent thinking dogs are generally harder to obedience train than those breeds that look to us for their every move. This may not be the best breed if you love to participate in obedience or rally, but they can be trained. Typically, owners who wish to keep these dogs as pets will enroll them in puppy classes and then basic obedience training as they get older. Socialization is necessary from day one. Puppies must be taught how to respond to a wide variety of people and how to act when visitors arrive at their home. For dogs that will be guarding livestock, they will need to be introduced to their charges at a young age, but supervision is necessary so the puppy doesn’t get hurt or the puppy doesn’t hurt an animal he is supposed to be guarding. If you are worried about training them to guard livestock, relax, it is in their genes so to speak. They must also be taught where their territory begins and ends. Repeated walks around the perimeter of your property may be necessary until they understand this principle. Puppies are keen observers and will mimic other dogs’ actions especially if they feel there is some benefit to them. The most successful Maremmas’ companion owners are committed to training on a regular basis. Patience and positive methods work best. Any type of adverse treatment may backfire with these dogs. They must learn that their owners are stern but fair and never harsh. The best owners also understand that they are not going to get instant responses to commands. These dogs are not the best choice for first time dog owners. Maremmas are generally a healthy breed and enjoy a life span of around 13+ years. Like all dogs, they will need periodic vaccinations for the common diseases of dogs including distemper, parvo, and others. Rabies vaccines are usually required by law and heartworm preventative is recommended to those that live in areas affected. If you are purchasing a puppy from a breeder, ask if their parent dogs have been certified free of hip dysplasia, elbow dysplasia and have their eyes certified. Hip dysplasia is a condition that affects the hip joint and frequently occurs in large breed dogs but also has been identified in small dogs as well. It is mainly a genetic problem caused by multiple genes. Its occurrence is also likely to be increased by environmental factors especially overfeeding young puppies so they grow too quickly. Other factors have also been identified such as neutering too young and strenuous exercise at a young age. Bloat is also a problem in this breed especially due to their deep-chested build. Feeding a lower protein diet in appropriate quantities will help prevent this life threatening condition. Look for foods that contain between 22 and 26% protein. Two smaller feedings, rather than one large feeding also helps prevent bloat. If your dog tends to eat too rapidly, you can purchase a specialized bowl that will prevent him from gulping the food. Click here to find out more about this bowl! Elbow Dysplasia is less common than Hip Dysplasia but has been estimated to occur in about 10% of all dog breeds. It affects the front elbows and can cause pain, stiffness, and lameness. Many affected dogs do not show symptoms right away and as such, can pass on this condition to their offspring. Like Hip Dysplasia, Elbow Dysplasia can be affected by overfeeding puppies causing them to grow too quickly. It is suspected that multiple genes are involved in this disease. Eye diseases can occur in any dog breed and most are thought to be inherited. Annual exams can be done by a board certified veterinary ophthalmologists on any dogs used for breeding and reported to the Orthopedic Foundation of America. Any dogs that fail their exam should not be bred. Some are also sensitive to anesthesia and some deworming preparations. 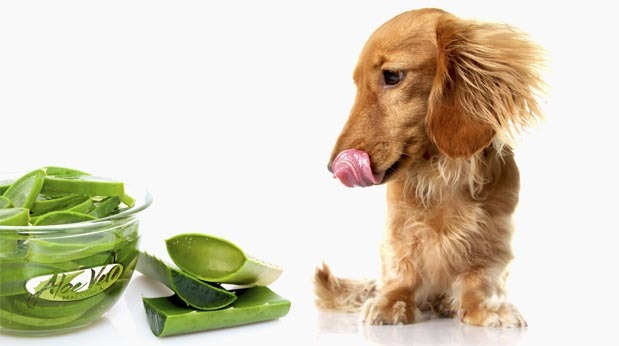 Flea and tick sprays, if frequently administered can remain on their thick coats and build up over time, especially without a regular bathing routine. Click on the pictures below to find out more about training your Maremma Sheepdog.